Toastmasters Youth Leadership Program is an excellent opportunity for you and your club members to gain extra experience as both speakers and leaders as you encourage young people in their communication skills. Will your club be sponsoring a Youth Leadership Program during this Toastmasters year and will you consider gaining valuable experience as the Coordinator ? The overwhelmingly positive response of District 91 Toastmasters who have led a YLP has been a joy and we have had excellent feedback from schools and youth groups we have worked with. The enthusiasm of the young people participants is infectious. Do feel free to contact me with your questions and most importantly to give news as your Youth Leadership Program progresses. I lo forward to hearing from you. Club leaders - have you registered your new committee? If your club has had its AGM and elected a new commitee for 2016/17 it's time to register the new commitee members on Club Central at toastmasters.org. Toastmaster Raphael Kopel a member of Watford Speakers ( and Past President of Experience French & St Paul's Speakers) has produced a video to commemorate the affiliation of our very first Gavel Club in District 91 at Merchant Taylors Prep School where he teaches. Enjoy watching the pupils aged 10 to 13 years old getting the most out of our Toastmasters program. Congratulations Raphael and your pupils for this achievement. Please note this Gavel is an 'in school' club and not an 'open' membership one. If you would like to see Youth Leadership Program and possibly Gavel Club at your son or daughter's school why not begin by discussing with your Club President and committee to see if it can be included as a club project, prior to contacting the school. 2015 / 2016 has been a very rich year for our youth work and we were able to share the fruits of our young people's efforts with some very fine speaking at the YLP Speaking Showcase last week at conference. My thanks to all and do contact me if your club would like to be involved in YLP. At London Athenians we’re always looking out for new ways to engage, entertain and challenge our members; in particular tailoring the content while retaining the core programme of table topics, speeches and evaluators. 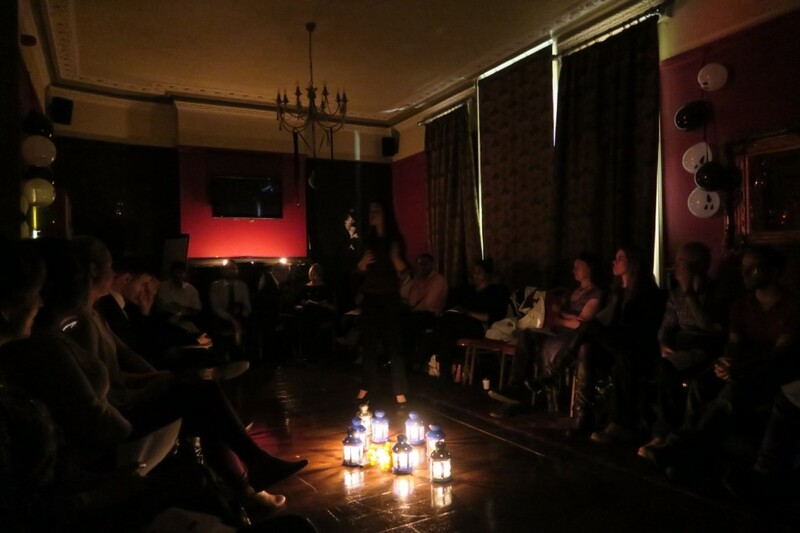 We would like to share the highlights of one of our special meetings, the Campfire Night, with the wider London Speaker community and share our top tips on adding some spice to the regular meetings. • Theme – as our Campfire Night was on the 27 October 2015, a Halloween theme was an obvious choice. We are lucky that our venue is usually already decorated for Halloween, but a few members brought some additional spooky items to set the scene. • Campfire – clearly there are health and safety issues around having a real fire! The next best option was to ask members to bring along lanterns and candles, which were set up in a circle in the middle of the room. It was really effective and we found that members felt empowered walking around the circle of light. • Room layout – deviating from the norm the chairs were laid out in a circle using the whole space. We had about 40 members and guests and this was a very inclusive and sociable layout. It encouraged people to take part without feeling intimidated by reducing the formality. • Agenda – the agenda format was adapted in EasySpeak to align with our revised format. We amended the timing to allocate Table Topics time for up to 40 speakers! We also added a couple of entertainment timeslots, adapted a couple of the speaker slots for debaters and increased the overall number of prepared speeches. This was important as we needed to know we could tailor the programme, but still finish the meeting at 9.30pm. • Tailoring the core programme – Table Topics with a twist! All attendees were given a number from 1 to 3 and everyone in the circle had the opportunity to speak; the 1s asked impromptu questions, the 2s responded in 1 minute and the 3s evaluated. The round robin Table Topics were a great success, encouraging even new guests to speak. Candlelight was a fitting setting for a couple of spooky tales in the prepared speeches, followed by a friendly “roast” about our President, Ashen Dachtler. As you may know London Athenians is blessed with members and guests from around the world. To make the most of that, in another deviation from the norm, we heard a debate between a Danish member and an Italian member, each attempting to persuade the audience that their country was better than the other. Votes were cast and Italy won the day for that particular debate! • Be surprising – Marta Mathea Radwan and her fellow singing enthusiasts from the London Open Choir were invited to warm up our voices with some fun and energetic vocal exercises. We started with the fundamentals including breathing, sound and volume. Shedding any fear of looking foolish, everyone threw themselves into the experience and soon Marta had the whole room making sweet music with our voices and not an instrument in sight. The London Open Choir welcomes any amateurs, musicians, singers and actors who are curious and enjoy a creative atmosphere to improve your musical skills. 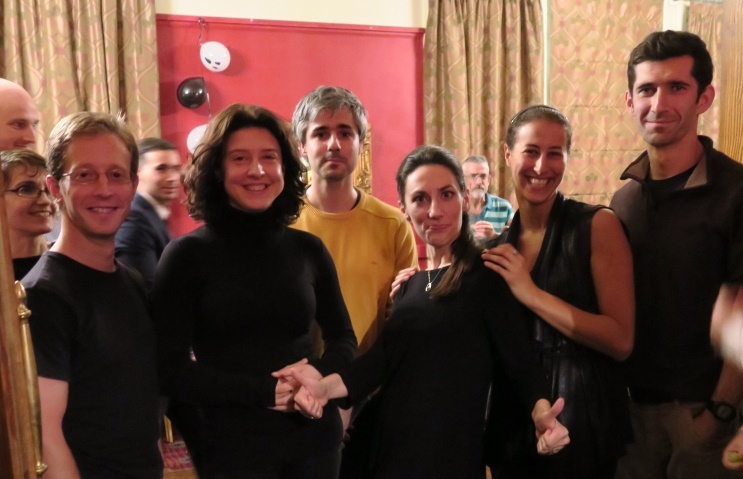 From left to right (in black): Members of the London Open Choir: Richard Scottow, Ewa Sokolowska, Marta Mathea Radwan (Director), Faiza and Krystian Godlewski With careful planning and unbounded enthusiasm, our Campfire Night was a resounding success and we hope you can take away some ideas for tailoring your meetings. Every time I am asked why I am involved with Toastmasters International, my reply is something along the lines, ’because Toastmasters are passionate about public speaking and sharing what they know about the fantastic opportunity for personal development that the Toastmaster journey can provide’. This is especially true about our members here at Speakers Of Croydon. Also an important characteristic of our members is that they all have a great ’can do’ attitude and an incredible ability to motivate and inspire. From the visitor feedback we were collecting at each meeting we knew that there was a demand for more information about Toastmasters, delivered in a more intensive way than we could possibly do at our regular meetings. It was this combination of factors that led us to introducing the Speechcraft program 2 years ago. Speechcraft is part of the Toastmasters International Success Communication Series and is a workshop that gives prospective new members a chance to see in detail ‘what Toastmasters is all about’. We decided to deliver the workshop over 4 consecutive weeks which was really tough going for all concerned but we felt it was the best way to get the maximum benefit from the program. In both years the workshops we ran were sold out pretty quickly after being publicised and the participants it attracted were a diverse group of people from a wide age range – from students, to people developing second or even third careers. As with all things at Toastmasters International, the workshop material and guidelines are very comprehensive and easy to follow. Our main aim was to deliver workshops that were challenging but fun. The participants were really enthusiastic and committed to fully engaging with the process in terms of the input, time and effort required,and our workshop leaders were excited to use their knowledge and experience to help others starting out on their public speaking journey. The results are a huge win/win. For the individuals that stay the course, their level of confidence has soared and they are committed to achieving their communications goals. For Speakers of Croydon, we have had an influx of new members and the four graduates from February have since quickly gone on to become Club committee members - injecting new energy and fresh ideas to reinvigorate our Club. We have also taken what we have learned in running Speechcraft to support Fairfield Speakers, a precharter club in our area who had a successful run of Speechcraft in June and are launching a second four week session in August! Our experience of Speechcraft has simply been great. It is such a useful tool to develop your Club. In fact I would argue it is the number one way to make your Club more attractive to new members and renew enthusiasm in existing members. Use in a collaborative way to amplify the impact and accelerate the learning. How can mentoring help your club? Berkeley Square Speakers held their inaugural mentor training event on Wednesday 1 October at the Killik Music Room in Mayfair. At this fun and insightful workshop club members learnt new tools and techniques to become more effective mentors in the club and in their personal and professional lives. Simon Frusher, VP Mentoring said "I found the session insightful, thoughtful and facilitated us as a group to think 'mentor'. I know this will bode well for us all within Toastmasters but also in all avenues of our lives." In what was a highly interactive session we learnt about the three stages of the mentoring relationship, the importance of establishing the ground rules, as well as exploring ways in which mentors can help mentees, and practicing some of the skills and techniques required for mentoring. We established that mentoring is a two way relationship and that for it to work both mentor and mentee have to get something out of it. Marc Lottig, Area 52 Governor, posited after the event that "good mentors are and remain first and foremost good mentees. The desire and willingness to seek input reflects maturity and confidence, two attributes which I believe are at least as important as experience and competence." Co-ordinated by Simon VP Mentoring, mentors at the club will incorporate the learnings from the session into their mentoring work. Andrew Towers was our host and Charlene Laidley facilitated this event for us. Charlene is a professional trainer of mentors, with over 8 years mentoring experience working with global corporations, non-profit and government organizations. Any one who wishes to get in touch with Charlene to see explore developing a mentoring programme at your club can do. Click here to email Charlene. Are you getting ready to celebrate TM Internationals 90th birthday? Toastmasters International was founded 90 years ago in 1924. Are you getting ready to celebrate the 90th birthday in October?! Watch the video and get creative! At a recebt Early Bird Speakers Toastmasters meeting, we tried something a little different with the evaluation format. Instead of the standard format of one evaluator per speech, we had a panel of evaluators, who all provided feedback on each speech. The varied format received a really positive response overall from the members, guests and speakers themselves. Read more and watch the video at http://www.earlybirdspeakers.co.uk/4669/the-panel-evaluation-by-numbers.